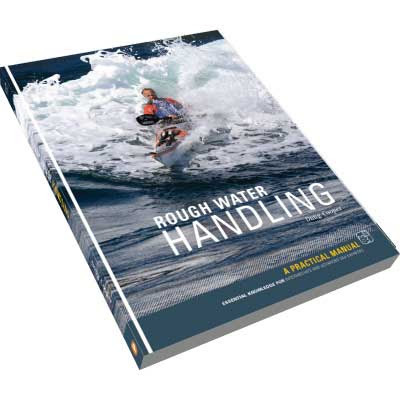 Rough water Handling by Doug Cooper review. Doug Cooper is head of Paddlesport at Glenmore Lodge in Scotland and is a renowned BCU level 5 sea kayak coach. I bought and enjoyed his previous book, Sea Kayak Handling, so I expected this to be a good book. What I was not expecting was just how good a book this would prove to be. It is remarkable how much insightful information has been condensed into such a compact and clear volume. However, this is no easy, cover to cover, bed time reading. The cover clearly identifies this as a practical manual and just as you wouldn't read all the chapters in the Haynes Honda CB500 Four '71-'75 manual to take the cylinder head off, so it is with Doug's new book. It is an ideal manual to support your learning of how to handle a particular set of conditions, which strokes to use, how and why. I much prefer this type of problem orientated approach, presented with solutions rather than the alternative: a blow by blow account of how to do each stroke that then leaves you to sort out when to use it. There is a useful introductory chapter on how to best use this book. The main chapters cover: High Winds, Moving Water, Surf, Tide Races, Rock Hopping, Open Crossings and Rolling but there are two excellent supplementary chapters on Physical and Psychological Considerations. These are vital areas to safe performance at high level, which are often ignored or glossed over in other books. I like the overall tone of this book a lot. Repeatedly the author talks of "to gradually build your skills", "build up gradually to those more committing environments" "set yourself appropriate goals". All too often, rough water rescue reports are examples where over enthusiasm "to push themselves" has led to trouble for those who are not experienced enough to realize that the conditions were well beyond their experience. As each chapter unfolds, techniques to handle a variety of conditions are clearly broken down into a set of bullet points and illustrated by very clear, though small photographs. I was delighted to see that most useful of "saviour" strokes, the bracing stern rudder, gets an early mention. There are a number of guest "Coaches top tip" boxes placed at relevant positions in the text. Each of these is an excellent addition to the text and they also act as a reminder of the respect in which Doug Cooper is held among his fellow coaches. (I particularly enjoyed the Howard Jeffs photo (with a crab) a reminder of a 2006 sea kayaking trip based on an old trawler.) Only Fiona Whitehead's tip had little relevance to me but others may find it rather more helpful! A very minor semantic criticism might come in the surfing section. Doug describes a turn at the top of the wave as a top turn. Surfers, kayak surfers and windsurfers might disagree. A true top turn comes after carving backup the wave face (nose first), following a bottom turn and that would be a fine trick in a sea kayak! In the book Doug is careful to identify situations where you might be learning techniques in remote and potentially dangerous situations. He refers the reader to other texts such as Gordon Brown's Sea Kayak and Franco Ferrero's Sea Kayak Navigation for advice about safe journeying. The chapter on physical considerations contains some excellent dietary and training advice and Doug moves even higher in my estimation as he is clearly enjoying a pint of Guinness in one photo! The chapter on psychological considerations addresses that fine line between self confidence and overconfidence, which can be particularly difficult to get right in the learning stages. A significant part of the success of this book must be due to the high quality photographs (many by Lara Tipper), which, despite their small size, clearly illustrate the techniques. The photos were all taken in good lighting conditions, which must have been a challenge in itself, given most are of Scottish locations. In conclusion this is a remarkable book which will help lead the progression of rough water handling skills of intermediate and advanced paddlers. It is not presented in a gung-ho, bravado fashion that might encourage foolhardy emulation before a kayaker is truly ready. Rather it emphasises building up experience, setting appropriate goals and taking advantage of coaching when necessary. The techniques are clearly illustrated and presented in the context of a rough water situation where their correct use will help get the paddler safely through the problem. This is a stunning book which I expect to refer to and learn from for years to come. Buy it! Finally, although I bought Doug's first book, this one was sent to me as a review copy by the publishers, Pesda Press. They needn't have bothered, I was going to buy it anyway.